The inception date of this fund is March 17, 2004. The lead manager of this fund since 2004 is Thomas W. L. Cameron. 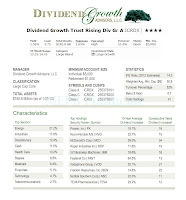 He is the Director and Founding Member of DGA (Dividend Growth Advisors). 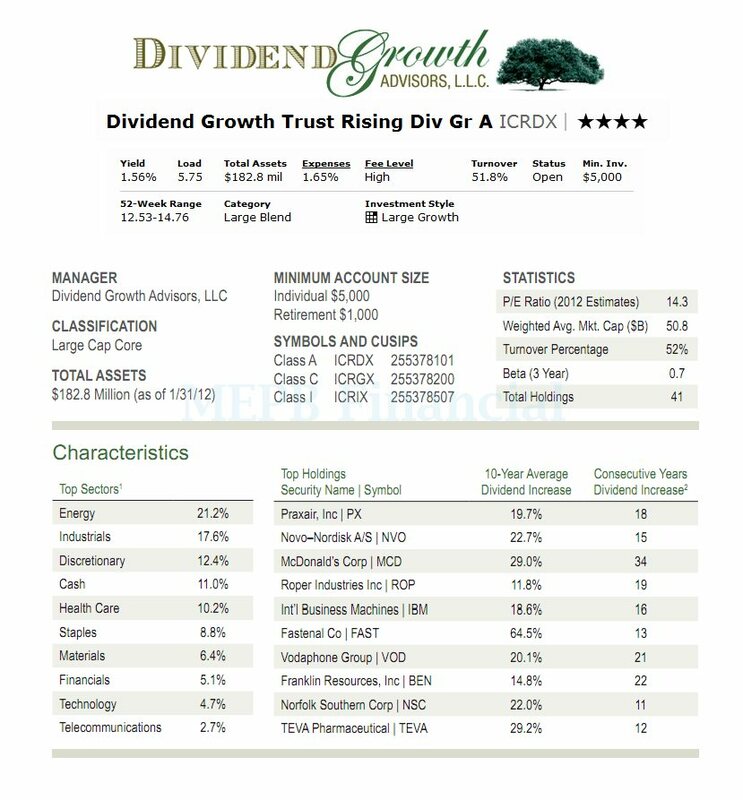 This best mutual fund is rated with 4-stars rating from Morningstar. The dividend yield of this large blend stock mutual fund is 1.56%. This dividend is distributed quarterly. The annual expense ratio of this fund (1.65%) is higher compared to the average in the Large Blend category (1.12%). The minimum initial investment is $5,000 for brokerage account and $1,000 for retirement account. The other classes of this fund are Class C (ICRGX) and Class I (ICRIX). The maximum sales charge for ICRDX is 5.75%, while the sales charge for ICRGX and ICRIX is 0.00%. This fund is available for purchase from 30 brokerages such as Scottrade Load, JP Morgan, E Trade No Load Fee, Firstrade, Matrix Financial Solutions, Fidelity Retails Fund Network, E Trade Financial, etc. As of January 2012, the top 10 holdings out of 41 total holdings are Fastenal Co (64.5%), TEVA Pharmaceutical (29.2%), McDonald’s Corp (29.0%), Novo-Nordisk (22.7%), Norfolk Southern Corp (22.0%), Vodaphone Group (20.1%), Praxiar Inc (19.7%), International Business Machines (18.6%), Franklin Resources Inc (14.8%), and Roper Industries Inc (11.8%). The top 5 sectors are Energy (21.2%), Industrials (17.6%), Discretionary (12.4%), Cash (11.0%) and Health Care (10.2%). Investing in this mutual fund involve principal risks such as Stock Market Risk, Non-Diversification risk, Foreign Securities risk, Smaller Companies risk, MLPs & Real Estate Investment Trusts risk, Management risk.